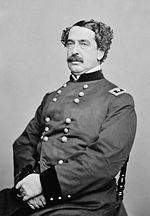 American Freemasonry’s history goes back as far as American History… in some ways they are parallel. George Washington was the Grand Master of a Lodge, and there were even actions taken to create the rank of Grand Master of the whole of the United States for him. According to the Grand Lodge of Texas, “On September 18, 1783, President George Washington dressed in his Masonic apron, leveled the cornerstone of the United States Capitol with the traditional Masonic ceremony.” If you’ve watched, the documentaries “Riddles in Stone”, or “America’s Secret Beginnings”, you’ve learned that masonic and occult symbols appear prominently all over Washington DC. The White House is situated at the tip of a large compass created by Vermont Avenue and Connecticut Avenue as they lead north. Of course, the emblem of Freemasonry is a compass overlapping a square (the tool). 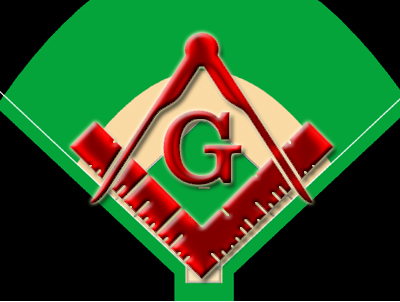 Masonic geometry and numerology (the sacred numbers) are appear on the streets as it appears on the field. It is the vernal equinox, and the ritual has begun. The participants enter into the sacred quadrant and take their stations at geometrically significant places. They are all men, dressed in pure white garb, marked with colorful esoteric symbols. They hold ritual implements in their hands. Four more men arrive; they are dressed in dark blue. Like concelebrating priests, they confer on the details of the liturgy. Then they too take their places. We need look no further than the local baseball diamond to find high ritual. There is no need to hanker after secret Masonic rites in closed halls or occult workings in incense-filled chambers. 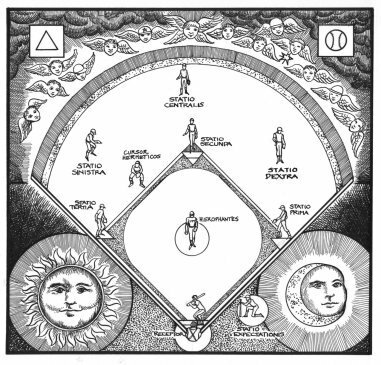 Wherever baseball is played, a true ritual goes on, as exoteric as daylight, as powerful as spring. Far more than other sports, baseball shows an esoteric structure. The game is played on a geomantically perfect square. Each base stands at what would be the quarters in Western esoteric ritual. These four bases also stand for the four elements, though attributions are variable: Home plate, with its coating of dust, seems to be Earth, while third base is traditionally referred to as the “hot corner,” signifying Fire. In the center is the pitcher’s mound, a circle in the middle of the square mandala, which speaks to us of the fifth element of Spirit, or the center point of wholeness. The men on the field hold to their positions as reverently as any Masonic or Hermetic ritualist. In the outfield stand the attendants in the outer courts. On each of the quarters stands a baseman, guarding his sacred trust. The shortstop moves between inner and outer, like swift Hermes, who moves between the worlds. The catcher, at his Earth station, also serves as Guardian of the Threshold; he challenges those who would enter or leave the quadrant as base runners. In the center is the pitcher, or Hierophant, upon whose offerings the course of the ritual depends. Completing the scene are the priests in blue, the umpires, who know the Law and keep the ritual correct. For rookies, each time at bat is an initiation; for others, wielding the sacred wand can be either an ordeal or a triumph. (For the sake of brevity, I will not elaborate on the phallic aspects of this ritual, which is done only by men and only during the most fertile times of the year.) Baseball is enriched not only by the geomancy of the field, but also by the numerology of the play itself. The batter’s ordeal may include a trinitarian three strikes, or four balls, which answer to the quadratic structure of the ritual space. The normal game lasts nine innings, that perfect number composed of three squared. Nine men play on a team at any one time (omitting the ritually incorrect designated hitter). These numbers are fraught with religious and occult significance. Baseball time is sacred time. Football, hockey, soccer and basketball run by the clock. Play is constrained by the seconds and minutes of linear time. Baseball’s time, though, is nonlinear, relativistic, where an inning can last as little as a few minutes, or as long as an hour. Indeed, the pace of the game is determined by the motion and position of the ball. Time moves slowly when the ball is hidden in the Hierophant’s glove, but moves far more quickly when that same ball is sailing over the left field wall for a home run. When that home run flies out of the ritual space into the outer depths, the happy ritualist puts down his wand and makes a circumambulation of the quadrant. Other baseball moves and customs show a similar respect for the hidden energies unleashed in this rite. Those men who face the Hierophant and his kneeling acolyte known as the catcher are seen to do all sorts of personal ritual gestures: crossing oneself, touching various parts of the body, spitting, or gesturing with the wand. All of these are aids to concentration; they also serve as banishing rituals in this moment of pressure. The spectators at the baseball rite are not restricted or silenced. They participate with their applause, cheers, mockery, or spontaneous cries. As would be expected of the profane, much profanity comes forth. 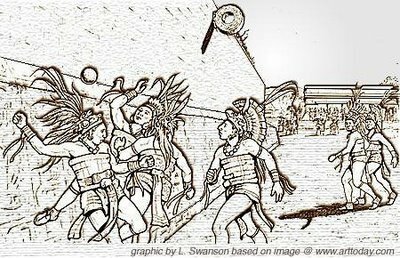 Sacred objects are often displayed by the fans (the very name “fan” comes from “fanatic,” which derives from the Latin fanum or temple); they hold banners, wear special headgear with appropriate symbols, and show garb decorated with the same symbols as the working group whose efforts they support. Fermented libations and ritual meals are a part of the baseball experience. The rite unites a community in a closeness that few religious liturgies, whether mainstream or esoteric, can achieve.